Mountain Mavericks Chalets In Morzine. Blog, News, Deals! Hotel L’aubergade Morzine hosts the first Cider, Beer and Sausage Festival! 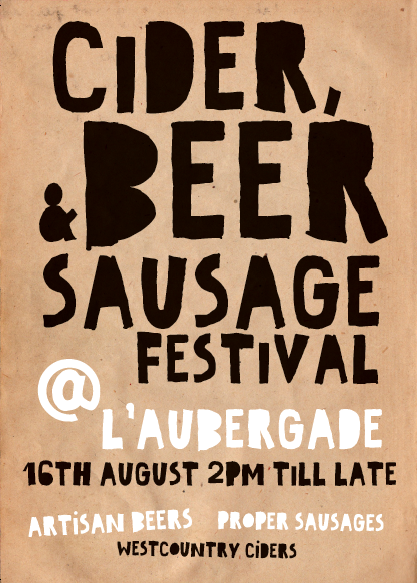 August 16th will see the inaugural Cider, Beer and Sausage Festival at our Hotel L’Aubergade in central Morzine and we couldn’t be more excited! Come and visit us from 2pm as we will have a range of delicious ciders and beers from local brewers as well as cider from the world capital of compressing apples – the Westcountry! There will also be a range of proper sausages in delicious flavours and yummy home-made chutneys. The very lovely Elisa Mason will be providing tunes all afternoon and hopefully the sun will be shining on our stunning terrace for the day. We are also hoping to squeeze in a spot of fundraising on the day for Morzine’s Three Peaks Challenge in aid of Unicef. There will be a raffle and you could win a whole host of prizes from activities to beauty treatments, massages to meals out and even a French course! Don’t forget we also have lots going on to keep the kiddies amused from mini golf, a lovely wide open play area and also lots of games! the fresh air, contact rowena@mountainmavericks.com to get booked in! Previous: Get your bike fixed on the Hotel L’aubergade Morzine terrace! Next: Baby Friendly Ski & Snowboard weeks allowing you to relax!